At the end of this year, I look back on what I feel thru this year. I have been thinking many, many, many things, it’s almost over capacity of my brain, and faced the big wall that I though I couldn’t over coma, and I loose control myself what I want to do and what I need to do for life. I believe the thing in front of me is the things I have to get over. I got many supports and appreciate for the strict comment background of supporting me. The supporter treat me very warm attitude and that touches my heart. It’s gonna be some shape what I felt and think on year 2010 in year 2011. I’ve learned a lot of things thru people. 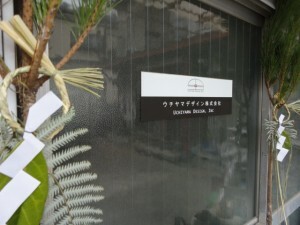 I thank you for all your support on 2010. We’ve met Mr. Tom Kantlehner who is yacht painter from US. I’ve asked to check ongoing painting hull, which is posted on Dec. 23rd on my blog. 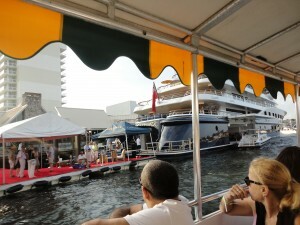 He is the leader of painter for 281’ Cakewalk that I had seen this year’s Ft. Lauderdale boat show. 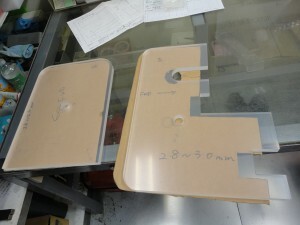 We discussed many things, such as paint material, tool, finish process and so on. Thank you for your advice. 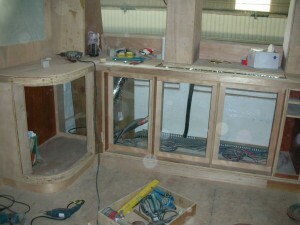 To build motor yacht involve with many processes. The photo is over 100 ft motor yacht with which we involved the interior design and project management. 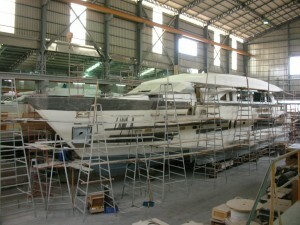 For FRP motor yacht, start from laminate the hull and put bulk head and longitudinal. 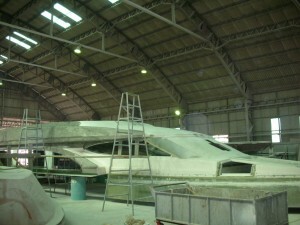 Superstructure lamination starts just little behind the hull lamination process. After put hull and superstructure out from molds, install large item, such as fuel oil tank, before coupling with superstructure. Install the deck and cut open hatch space. 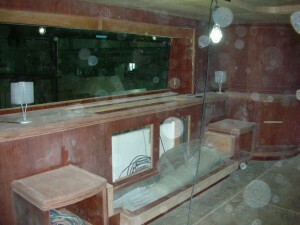 In lower deck, there are already bulkh’d and interior wall almost. Wiring and piping starts from lower deck. 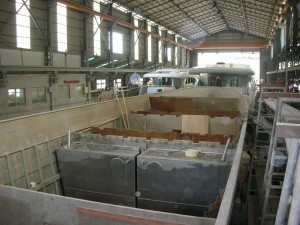 Boat building construction is build up from lower deck to upper deck. After interior base wall using veneer is done, put the finish material on each part. This boat was wood with high gross finish. It depends on the size of yacht, however, building motor yacht needs certain amount of time. Time schedule is must item from start. Boat building never pushes by dead line. It’s gonna be terrible finish product and nobody is happy. There should be initial plan first and modify many, many time to catch up with the site condition. We’ve ordered to make custom translucent acrylic board that will use in boat engine room floor. 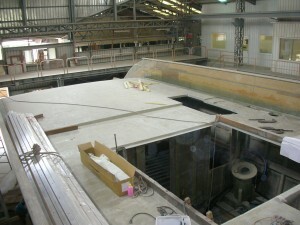 To use translucent board in engine room is very easy to check the boat bottom condition. 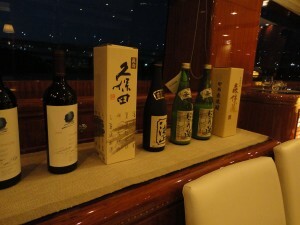 It’s typical to use wine glass acrylic holder on boat. The material is easy to process making many type of shapes. Mega Yacht owner held year end party on his over 100ft yacht. 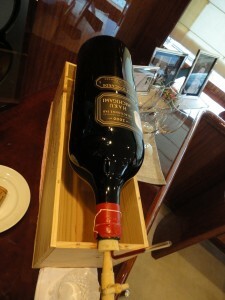 There were varieties of liquor, 6L red wine and many from guest. I displayed on the piano table. Sushi chef served very nice sushi at the counter. 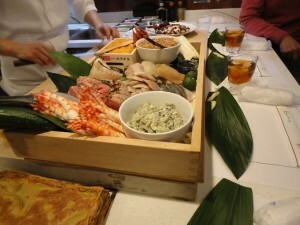 It seems like every guests had good food and drinks. We appreciate for the boarding in cold weather.